Whether fishing the Florida flats for big reds or the coast of California for calicos, SpiderWire Ultracast Braid hooks the fish. The smooth castability of a tight 8-strand weave aids in the task with colors that are all but invisible. Anglers can choose from three different constructions. SpiderWire Invisi-Braid disappears but only once it enters the water. 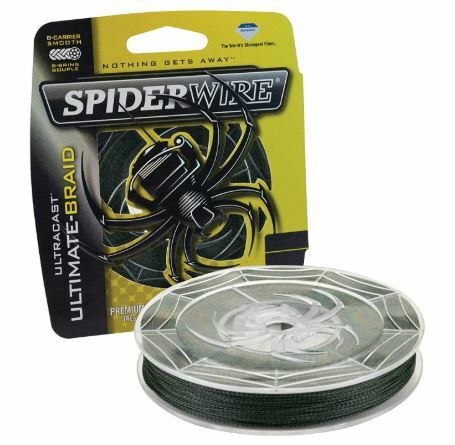 Wrap up with SpiderWire Ultimate Braid for its Low-Vis Green color. Finally, take advantage of SpiderWire Fluoro-Braid. Its blend of Dyneema and Gore fibers make it one of the only sinking braids. Catch them all in the following review. 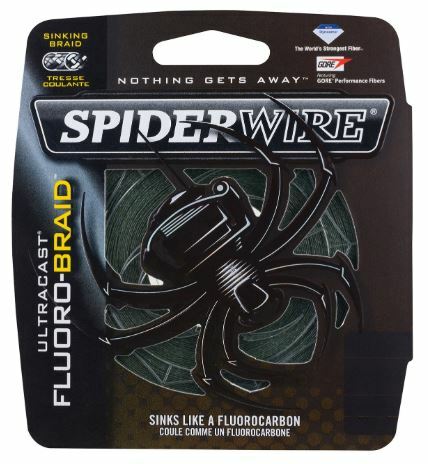 Product: SpiderWire Ultracast Ultimate Braid, Invisi-Braid, & Fluoro-Braid. SpiderWire gives the name Ultracast to their 8-strand series of braided fishing line. The three products offer different colors and specific advantages but also share many similarities. Whether your needs fall to the standard Ultimate, Invisi-Braid, or Fluoro-Braid version, they all feature the same thin line diameter. Likewise, all SpiderWire Ultracast braids are available in tests from 6 to 80-pounds and spool lengths of 125 to 3000-yards. SpiderWire Ultracast braids each have their own color. To the human eye, the Invisi-Braid looks as white as a ghost both in and out of the water. It’s special properties prevent fish from being able to detect it. SpiderWire calls this white colored line translucent. Both the Ultimate Braid and the Fluoro-Braid come in green, though the Ultimate is Low-Vis. The Fluoro-Braid comes in Moss Green. Ultracast braids offer different line tests and spool lengths depending on which of the three you inspect. Check for complete spool details below. Though the spools and tests may differ between the three SpiderWire Ultracast braids, their specs are all the same. SpiderWire provides the diameters of each test as well as their monofilament equals. Check below for full details. SpiderWire uses 8 carriers and a tight weave while manufacturing their Ultracast braids. The result is a PE line with a high pic count (weaves per inch). This makes the profile more round and smooths out the line for longer casts. It also increases the durability and abrasion resistance of the line. All three brands of SpiderWire Ultracast feature the 8-strand, high-pic count design. Another common denominator to three Ultracast labels is their use of strong Dyneema fiber. In addition to Dyneema, Ultracast Fluoro-Braid blends in a mix of GORE fiber. Dyneema is a high-density polyethylene fiber which gives braid the properties it’s so well known for. Like other effective braids, SpiderWire Ultracast won’t stretch. Because of this characteristic, the line is extremely sensitive to the slightest action at the end. SpiderWire Ultracast Fluoro-Braid takes a different approach to the sinking question than brands like Sufix 832 Advanced Superline. While Sufix uses 1-strand of GORE and 7 Dyneema, Fluoro-Braid uses a blend of the two. There’s no doubt that more GORE helps the Fluoro-Braid in its descent. Fluoro-Braid comes in handy for several reasons. It makes it easier to manage your line, keeping it tight on longer bait soaks. The sinking effect gets lures down in the water column and in front of schools faster. It also will help give diving style jigs, like Rapalas, a bit more depth. The beauty of SpiderWire Ultracast Fluoro-Braid is. of course, that it has all the strength of other braided lines. SpiderWire is able to keep the diameter thin on their Ultracast braided lines due to their cold fusion process. Instead of fusing the braid with heat that can expand the fiber, they’ve developed a proprietary new technique. However SpiderWire is able to accomplish this, the line comes out smooth and silky to the touch. For a good visual comparison to other braided lines in a magnified view, visit Black Bass Reviews. 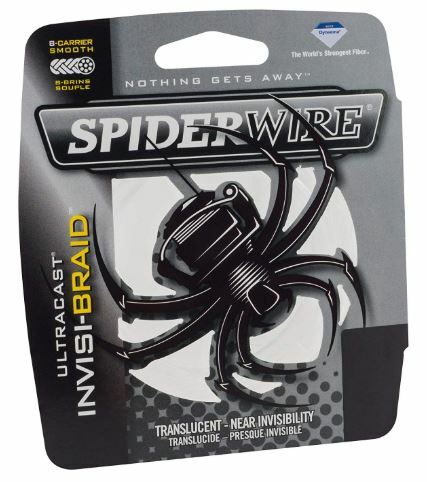 If you take a look at SpiderWire Ultracast Invisi-Braid, your first reaction might be to laugh. Anglers do see this white colored line and wonder how it could ever be considered invisible. Even in the water, Ultracast Invisi-Braid is easy to follow with the human eye. It isn’t the same way for fish. The reflection of light off its translucent surface makes the white color nearly impossible for fish to see in the water. I’m a witness to times when translucent braid outperformed all other colors. SpiderWire Ultracast braided fishing lines offer several advantages. They are thin for an 8-strand braid, which will give you more line on your reel. Noisy casts are no longer an issue with Ultracast braids and the line is easy on your gear. Along with a smooth and durable 8-strand braid, anglers can use the Invisi-Braid to their benefit. There are times when fish are line shy and only the translucent line will work. Anglers prefer the sinking nature of GORE when using the Fluoro-Braid, especially when fish are lower in the water column. What stands out as the biggest detriments to anglers is the higher cost, lack of color options and larger test availability. SpiderWire Ultracast braids max out at 80-pounds, which leaves nothing for larger applications. Though the one translucent white option in the Invisi-Braid is understandable, it would be nice to see a Hi-Vis Yellow or Ocean Blue in the other two labels. Smooth braids like SpiderWire Ultracast and Power Pro Super 8 Slick slide through the guides silently. They aren’t, however, always as good at cutting through weeds as tough 4-strand braids. SpiderWire Ultracast braids are a great addition to the inshore coastal angler’s reel. Right there in the name, SpiderWire tells us this braid is for casting. Its smooth profile lends itself perfectly to the baitcasting reel and will help reach those far off holes in the kelp beds. There are uses when fish become line shy and when you need to get your line down. SpiderWire Ultracast is supple enough to use on a spinning reel, but you might prefer the action of Daiwa J Braid better. For questions, suggestions, contact info and more, anglers can visit the SpiderWire website. They provide a Frequently Asked Questions page and full contact details. You can read about their return and exchange policies or browse their other lines. Their Contact page shows their phone number, full address, and includes an email message form. If not for the thinner diameter and the higher budget, SpiderWire Ultracast would score in the mid-nineties The score also doesn’t consider the lack of uses for higher test ranges or additional color options. These are factors that might drive that score down for some angler’s uses. 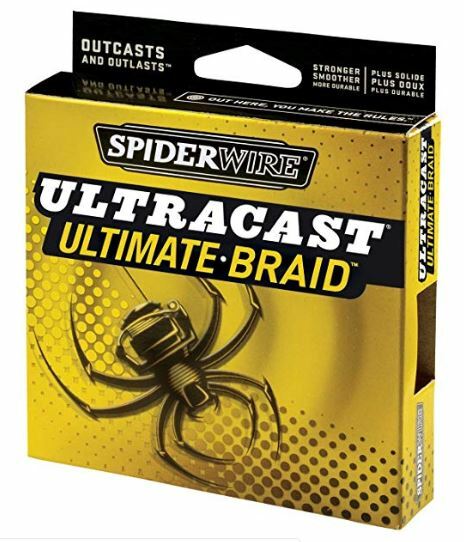 What are your experiences with SpiderWire Ultracast braids? Do you have any pointers or additional questions? Speak up in the comment section below and I’ll get back to you in a flash. Tight lines until next time. FishtFight.com.